Neanderthal Robot Food Forager – Finding Food! In ancient times, Neanderthals did not grow crops and they had to find all their food in the forests. They travelled each day foraging for food – if they could not find any, they came home hungry that day! Life would be a lot more difficult for them than for us, as we can go down to the corner shop for food – much more convenient! Since Neanderthals died out in Europe about 30,000 years ago, we don’t really know what they looked like, but some scientists think they look something like the image above. What sort of food did Neanderthals eat? We know from looking at burial sites that they ate berries. 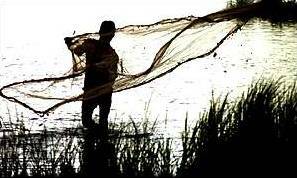 Some scientists think they ate fish too, perhaps netting it like the human fisherman below. 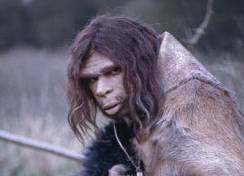 Most scientists think Neanderthals also enjoyed honey, gathering it in the forest like the South American Indian pictured below. 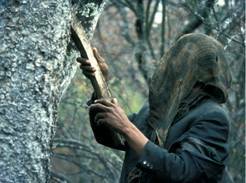 Honey was the only sweet food available to tribal people, and so it was much treasured, but gathering honey was dangerous – the bee’s hives were often high in the trees, and rotten branches could mean that Neanderthals could fall and break bones – to say nothing of being painfully stung by the bees. Real food foraging sounds fun – as long as you took your lunch with you and did not have to depend on eating only what you found, because finding food in the forest can be difficult, and you can often go hungry at the end of the day. So as not to be hungry, let us try food foraging using Robots. We will imagine the forest is like the arena above. The blue central area will be the forest containing berry bushes (a blue forest? – you need a good imagination for this challenge!). The white area surrounding the forest will be a stream containing fish. The black area around the arena will be a cliff—go beyond that and your imitation Robot Neanderthal will fall to his or her death! The green cups in the middle of the blue forest will be pretend berry bushes that our Robot forager will have to gather and take back to the home square where it started from. We can imagine the fish in the stream to be the transparent cups in the white stream between the blue forest and the black cliff edge. Just as in real life fishing is more difficult than gathering berries, so gathering the transparent cups representing fish and bringing them back home may be more difficult than collecting berries. Where Do We Place the Food? The green berry bushes go in the blue forest. The transparent fish go in the white stream. The red honey hive goes on the black cliff edge. Talk to you teacher or mentor and agree just where to place each of these food items. A smaller robot may be an advantage when trying to gather the fish and honey – a large one may fall over the cliff edge. If you still have the small Robots you used in the Floor Cleaner Challenges, they could be a good place to start. I don’t know of any official rules for Neanderthal Robot Food Foraging, so we can make up our own rules. Let us start our Robot foraging trips from the bottom left-hand corner of the arena shown above. Your Robot will aim to gather as much food as possible in 2 minutes, without falling over the edge of the cliff and dying. Since the berry bushes are the easiest to collect, we could score 1 point for each berry bush your Robot finds and touches, changing to 2 points if your forager brings it back to the dark blue home square for the tribe to eat. Fish are harder, so perhaps we could score 2 points for each fish found and touched, which could change to 4 points if your Robot can bring the fish to the home square. Honey is very difficult, so perhaps 4 points could be given if your Robot manages to touch the honey, changing to 8 points if your Robot manages the remarkable feat of bringing the honey back to your home square for your tribe to enjoy. Discuss how you would like to score these food gathering trips with your mentor or teacher. Together, you can change any of these rules any way you like, you can even make up rules that are completely your own – the main purpose is to have fun while learning about robotics! Think about how you want your Robot Food Forager to find the food. What is the easiest way to instruct your robot to collect the food items? What should your Robot do if it detects food? Will it be able to tell what sort of food it has found? Which sensor would be best? Would your robot need more than one sensor, or would just one be best? Is the easiest way the best way, or are some more complicated ways better? Agree before the Robot Neanderthal Forager Food Gathering Trips where to place the food. If several Forager Robots are competing against each other, the food should be in the same position for each different Robot foraging trip. The best Robot could be the one that scores the most food points in 2 minutes. If two Robots bring back the same number of food points, the result is a draw. If the best robot can not be decided after 2 rounds of a foraging, a third foraging contest with a longer time limit could be held, with the Robot that accumulates the greatest number of food points being considered the best imitation Robot Neanderthal Food Gatherer. If the score is the same after, say, 4 minutes, the contest could be declared a draw. If a Robot Food Gatherer falls over the cliff and dies, that is the end of that food gathering trip – however all is not lost because the village witch doctor can bring your Robot back to life and you can then have another food gathering trip when it is your Robot’s turn next time! To assist keeping score, Neanderthal Food Foraging Score Sheets in Microsoft Word 2003 format can be seen by clicking here. Go build your imitation Neanderthal Food Gatherer!